Iqama is an actually residence permit for expatriates who came into KSA for work or business purposes. The newer version for Iqama is known as Muqeem Card which was started from 1437 Hijri (14th Oct 2015). Anyone having relative or any other contact in Saudi Arabia will surely have an idea about of Iqama or may just hear the word of Iqama. How to apply for new Saudi Iqama? or what is Iqama and why it is so important. You might have a vague clue about iqama. Iqama Or Visa Or both? In other countries, foreign require visa only. In Saudi Arabia, Foreigner needs Iqama to stay in Saudi Arabia. They can be expats, immigrants, refugees etc. Anyone who want to live in the kingdom has Work Visa or permanent family visa and after 90 days they would require Iqama as well. So with Visa iqama is equally important if anyone want to stay there for more than 90 days. Iqama is more like an identity card for foreign in Saudi Arabia. It is a personal identification card that is issued by the Saudi government. As identity card is important to live in any country so Iqama is also core and basic need to live in the kingdom. Iqama is a prime identity card to acquire all basic needs like SIM, Bank account, license etc. It will be the burden of the Employer or Sponsor to take care of Iqama expenses. If they are unable to do so, expats will be free to transfer their sponsorship without Sponsor approval. If a person caught without Iqama he may jailed or fined or in severe case can be deported too. It depends upon that situation. So it’s better to have Iqama if you have plan to live there. If you are living since a long time and have iqama so you can check your iqama status or expiry date online. Muqeem card contains a lot of personal details that can be used to verify a person. These details include person’s date of birth, name, passport number and other essential details that can be used to track him or her. It will be Expires in minimum 5 years and maximum Lifetime and can be renew by the employer through abshir service or muqeem online service. If muqeem card is about to expire, it’s good to withdraw all money from bank account. The laws related to Iqama keep changing and a lot depends on the industry you are working in and your employer. How to check Huroob status of iqama on MOI and MOL? How to check status of changed iqama profession? How to get registered with Saudi engineering council? 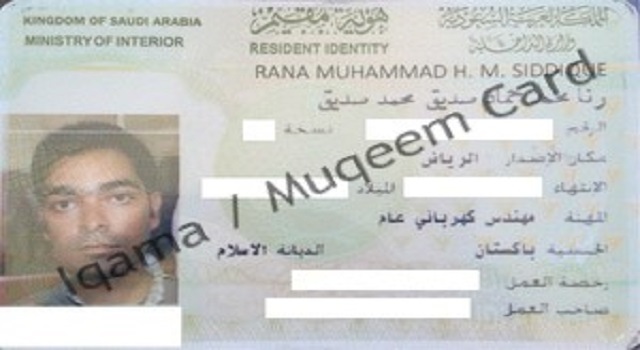 How to check iqama is transferred to new sponsor or not on MOI? How to book birth certificate appointment at MOI Saudi Arabia? Police clearance certificate for expatriates from Saudi Arabia. How to check remaining balacne of mobily zain and stc?